Chritmas Gift Journey info about the game-Games2Rule. A little boy lives in his own mansion with his arrogant stepmother. She tortures the little boy every day without any reason. But the boy loves his stepmother because of his father. The lady didn't like the happiness and joy of the boy so she always does opposite to the little boy desire. One day little boy got a letter which is came from North Pole. But his stepmother hesitates to go there and she locked the boy in a room. 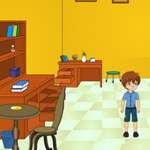 The little boy plan to escape from the mansion and get the Christmas gift from Santa's hand.